Star Wars The Black Series Mace Windu Force FX Lightsaber. An awesome collectible that's perfect for cosplay, too! Authentic prop replica includes a real metal hilt. Fashioned after Mace Windu's lightsaber in Revenge of the Sith. The quality and realism Star Wars devotees love! Fashioned after Mace Windu's lightsaber in Revenge of the Sith, the Star Wars The Black Series Mace Windu Episode III Force FX Lightsaber is a movie-true reproduction of the Jedi Master's iconic purple weapon. The authentic prop replica includes a real metal hilt and a clear display stand for ultimate collectability. It's an awesome collectible that's perfect for cosplay, too! Requires 3 "AA" batteries, not included. Fans can visualize the biggest battles and missions in the Star Wars saga with lightsabers from The Black Series. With exquisite features and decoration, this series embodies the quality and realism Star Wars devotees love. 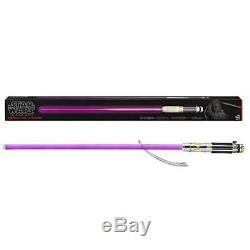 The item "Star Wars The Black Series Mace Windu Lightsaber Force FX III Ships Jan 21st" is in sale since Friday, December 28, 2018. This item is in the category "Collectibles\Science Fiction & Horror\Star Wars\Products, Non-Film Specific\Lightsabers, Weapons". The seller is "limited_treasure" and is located in Plano, Texas. This item can be shipped to United States, Canada, United Kingdom, Denmark, Romania, Slovakia, Bulgaria, Czech republic, Finland, Hungary, Latvia, Lithuania, Malta, Estonia, Australia, Greece, Portugal, Cyprus, Slovenia, Japan, China, Sweden, South Korea, Indonesia, Taiwan, South africa, Thailand, Belgium, France, Hong Kong, Ireland, Netherlands, Poland, Spain, Italy, Germany, Austria, Bahamas, Israel, Mexico, New Zealand, Philippines, Singapore, Switzerland, Norway, Saudi arabia, Ukraine, United arab emirates, Qatar, Kuwait, Bahrain, Croatia, Malaysia, Brazil, Guatemala, El salvador, Honduras, Jamaica, Viet nam.